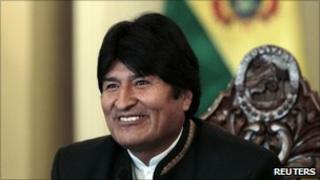 Bolivia and the US have agreed to restore full diplomatic ties three years after the US ambassador to La Paz was expelled by President Evo Morales. In an agreement signed in Washington, the two nations pledged to work together to fight drug trafficking. President Morales expelled US drug enforcement agents and the ambassador, Philip Goldberg, in 2008, accusing them of conspiring against the government. But relations have improved and talks began last year to reinstate ties. The agreement sees "the swift return of ambassadors to Washington and La Paz," according to a Bolivian Foreign Ministry statement cited by Reuters news agency. "The accord's objectives include strengthening and deepening bilateral relations... (and) supporting efficient co-operation against the production and trafficking of illegal drugs," the statement said. But the pact does not mention whether US drug agents will return to Bolivia, the world's third largest cocaine producer. In 2008, Mr Morales, a critic of Washington's policies in Latin America, accused Mr Goldberg of inciting pro-autonomy opposition leaders in the country's eastern lowlands. The Bolivian president - who also heads the country's coca growers' union - expelled US drug enforcement agents two months afterwards. In response, the US sent the Bolivian ambassador back. Correspondents say relations between the two countries have gradually improved since the row, but tensions remain. In March, Mr Morales hit out at the US government over critical drug reports which the Bolivian leader said were intended to link his government with narcotic smuggling.